Dedicated staff will cater to your individual needs, making for a truly memorable stay.Kambaku provides exclusive yet affordable accommodation that is meticulously designed, beautifully constructed and tastefully decorated to blend in with the charm and serenity of the surrounding bush, of which there are spectacular views. 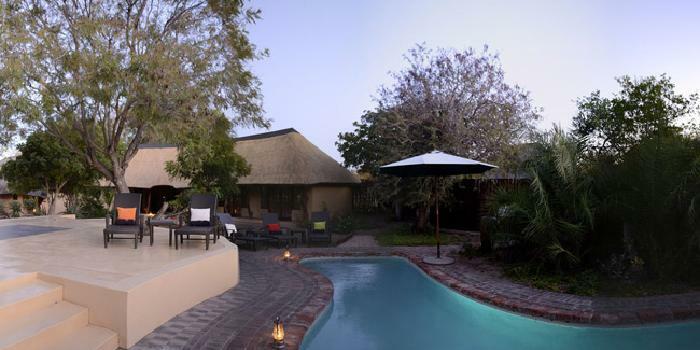 Situated in the unspoilt natural wilderness of the Timbavati Private Nature Reserve. A dining area, bar, lounge, library, viewing area, swimming pool, boma, morning and afternoon/evening game drives in open 4×4 vehicles and a short bush walk with an armed ranger. Accommodation at Kambaku Safari Lodge is in eight thatched chalets with en suite facilities arranged in a semi-circle overlooking the waterhole. Creating a feeling of relaxed intimacy, the owner-run lodge accommodates only sixteen guests and is ideal for hosting small family gatherings, friends or exclusive business events. To truly immerse yourself in the rustic bush experience, the chalets are equipped with lanterns for light as well as 220 volt power points for your convenience. Overhead fans provide welcome relief during summer and our gas geysers provide instant hot water. For those who enjoy a taste of romantic colonialism, the rooms are equipped with four poster beds, crisp white linen and mosquito nets. Approximately 45 minutes from Hoedspruit/Eastgate Airport.